SAN LUIS OBISPO — More than 70 varieties of tomato plants will be available at Cal Poly’s annual Tomato Mania plant sale from 9 a.m. to 4 p.m. Saturday and Sunday, April 7 and 8, at the Horticulture Unit near the Poly Plant Shop. Brandywine, Early Girl, Beefsteak, Homestead, Abe Lincoln Improved and a selection of cherry tomato plants, including Bumble Bee Surprise, are some of the unique cultivars that will be available during the student-run enterprise project, one of several such hands-on courses offered by the university’s College of Agriculture, Food and Environmental Sciences. The plants cost $7, with a quantity discount given for five or more plants. This year the program is directed by a team of six students who have grown nearly 5,000 tomato plants from seed to provide home gardeners with quality plants that will produce fresh tomatoes throughout summer. 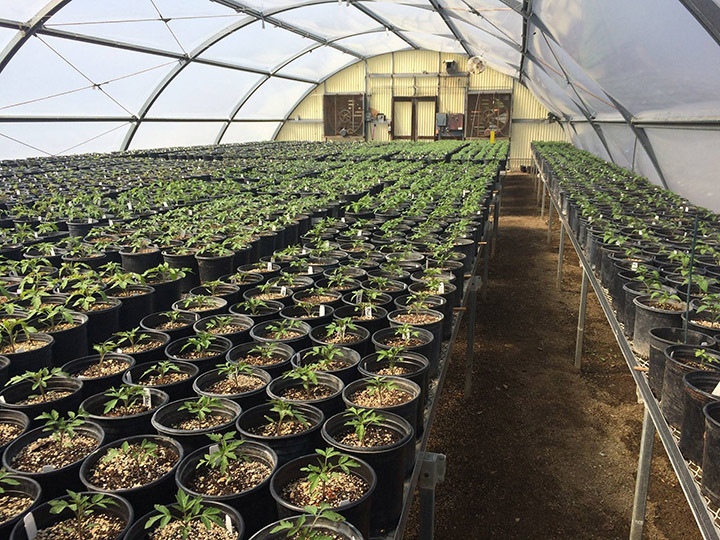 Students began seeding the plants in early February and have tended to them in the campus greenhouses. The sale will take place at the Environmental Horticultural Sciences Building (No. 48) on Via Carta Road off Highland Drive. Campus maps are available online at https://afd.calpoly.edu/facilities/maps.asp. For more information, call 805-756-1106 or visit www.polyplantshop.com to see the full Tomato Mania 2018 catalog. Follow Cal Poly Tomato Mania on Facebook and Instagram for updates. Tomato plants shown at the campus greenhouses in the Horticulture Unit, where the plants are grown from seed starting in February.